Blog Note: Have you noticed a few hiccups in our schedule lately? We were preoccupied online and apologize for the disruptions. We look forward to getting back into the swing of things. Maybe this break has offered you time to think up a pitch for our blog? As always, we’d love to hear it and work with you on getting your Guiding-related story in front of our audience! I can trace when I became a lifer way back to the 80’s. My mom was never a Girl Guide or a leader, so I was mid-way through grade one when IT happened. One day her bouncing (re: loud) favorite (re: most demanding for time) daughter came home learning that the girl only houses away got to go to Brownies….well folks, as my mom might tell it, there was a “light bulb and angels singing” moment in our kitchen. Here was the opportunity for my mom to get a break from me, and vice versa. I can’t say for certain, but I don’t think the car ever came to a full stop when she dropped me off at Brownies. Nor can I say that I didn’t LEAP at the chance to run into my Unit meeting. I do remember that Brownies offered me the opportunity to learn something new, sing, become a responsible “Sixer”, go on field trips AND earn badges. 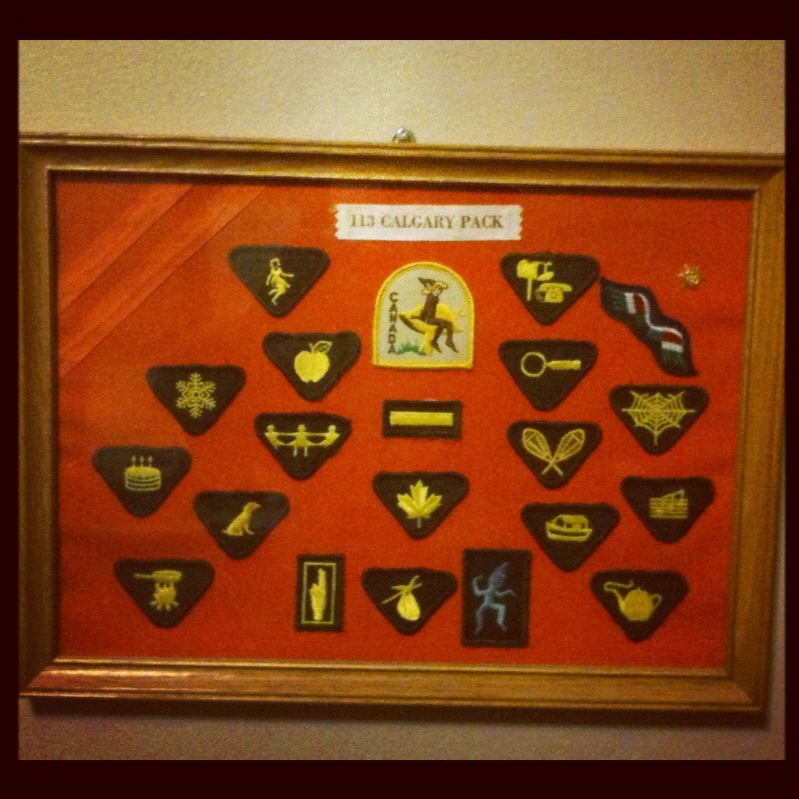 I coveted earning badges from day one, until the last Ranger badge was sewn on my sash. But we should never think that a “lifer” is someone who has more years on a [membership] pin than someone else. I have met women who left the organization in Brownies/Guides only to come back as an adult to volunteer and be amazing leaders in the organization. Every time I put on the uniform, or try to hold back tears as we sing “On My Honour” together in a crowd, I know for sure, that I’ll be back the next year and the year after that doing the same. I hope that along the way – knowing that part of my “lifer” branding is because of the leaders I had – that I am inspiring a girl to want to be a “lifer” too. This entry was posted in Girls' Guides and tagged volunteer. Bookmark the permalink. 9 Responses to Girl Guide Membership Expiry? Never! I do the same when we sing On my Honour that somgs just touches my heart! And that was me Brownie and Girl Guide left and became a leader when my oldest daughter joined. I call my co leader who was a Spark and now a leader a career Guider! I realized I was a lifer when upon learning I was pregnant with a girl I told everyone I was having a ‘Brownie’. I’ve been a leader since 2001 and parents asks me all the time which girl is ‘mine’ and in a way they all are but next year my daughter finally joins my Brownie unit. I went into Guiding to give back the 8 years I got out of it as a youth member and now in my 11th year as a leader I still feel like I owe Girl Guides. You remind me of my own daughter. Last year when she was finishing up Brownies she told me she ‘never wanted to not be a Girl Guide’. I guess that was her moment and she still stands by it. In fact she has encouraged several of her friends to give it a try. Some really like it and others didn’t, and that’s okay. She is a GG ambassador at 9 and that makes me so happy. I myself finished Guides and then the Pathfinder unit I was to join in my small town disbanded as there were no leaders and only two kids. Later on in my teenage years I decided that if I had a little girl (truthfully I think I would have done it anyway) that I would become a leader and join GG again. How delighted was I when I received my 5 year pin in my first year as a leader because I had been a girl member and those years still counted. Well they always counted to me because I too still love to sing Barges and know that I learned how to braid and sew on a button in Brownies and have the best memories of cleaning lattrines at camp. So happy to be re-living the experience with my daughter. And you know Sarah, only “lifer’s” will really get this story. There’s a real moment when you think, “this is for me” and I hope I’ll always love it this much! Just wait till you have kids of your own. Watermelon. For me it was when during my first year of university. I wasn’t involved in Guiding and it nearly drove me insane. That was the first time I wasn’t involved since I started brownies at 6 and the last time. I don’t have a daughter rather all my Guides are ‘my girls’ and they all have the unique ability to drive me insane and keep me sane at the same time. I do really enjoy ‘On my Honour’ but the one that really brings tears to my eyes is ‘Remember me’ which is Doe Lake’s camp song. I don’t remember a time when I wasn’t a Guider. I went right up through and when I found out I was having a girl in 2011, my first thought was YES I AM GOING BACK TO SPARKS! I love the sisterhood of the women I have met who started out as my mentors and are now my friends. My daughter, Aislyn became a “lifer” the moment she went to her first Brownie meeting last year! Though she only was in Brownies for one year (because of her age), she fell deeply in love with it so much that she earned all 71 Brownie Badges in her one and only Brownie year! Now she’s in Guides and is loving it just as much! She still plans on earning all her Guiding Badges (just over 3 years, instead of one lol). She’s NOT a competitive girl (unlike her little Spark sister). Aislyn wants all the badges, mostly because she wants the set! (like collecting hockey cards, but instead of buying them, she earns them). She’s OK that she won’t have the Spark set, though she wishes we enrolled her in Sparks instead of dance. For Aislyn, this has been the best decision *EVER*, to enroll her in Girl Guiding!